The Nightscout Foundation exists to encourage and support the creation of open source technology projects that enhance the lives of people with Type 1 Diabetes and those who love them. This includes advocacy, and direct software and hardware development. 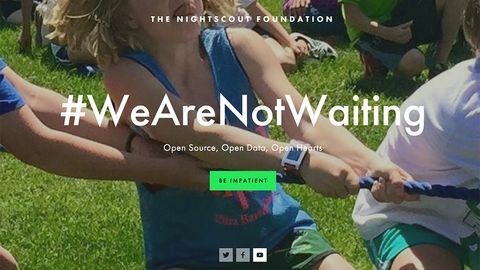 The Nightscout Foundation is part of the #wearenotwaiting movement, a community of PWD and their families who found ways to unlock their/their children's CGM glucose data and feed it to the cloud so it could be viewed remotely in realtime from anywhere in the world on any device. The code is free and open source and there is now a growing body of people who use the software (and in some cases build additional hardware) using the published Nightscout guides. It makes fascinating reading for anyone interested in T1. Nightscout is a DIY system for transferring CGM readings between the CGM, smart watches and other mobile devices. For some set-ups users may have to build some of the electronics themselves and must be aware of the limitations of the system. Offers interesting possibilities for advanced users. We are excited at the opportunities and possibilities these new 'open source' approaches to healthcare devices, however we note that there are concerns from some quarters about Nightscout and device warranties. Our understanding is that in the vast majority of cases Nightscout is simply reading information broadcast by the device via software, and the warranty should be entirely unaffected. In certain configurations (e.g. where a cable is used to repeatedly connect to the device's USB port) manufacturers may not cover a broken port following Nightscout use. If in any doubt contact your device manufacturer or the Nightscout community. Nightscout has provided over 30,000 people worldwide with the opportunities to access their data remotely in a way that suits them. In many cases this means sharing your data with loved ones. This has several potential benefits (particularly around hypoglycaemia) but will not suit everyone. #wearenotwaiting is a hashtag which draws together many of these grass-roots projects on various social media platforms. People connected with diabetes (and expertise) deciding not to wait for manufacturers to go through the lengthy development process but to create their own healthcare technologies. By its nature, this means that these projects have not been through the regulatory approval processes that would be required of a medical technology manufacturer. Additionally some of the technology needed to access your data is not provided by the NHS, such as smart watch/mobile phone etc which you will need to buy yourself.